The economically important big bluestem grass—a dominant prairie grass and a major forage grass for cattle—is predicted to reduce its growth and stature by up to 60 percent percent in the next 75 years because of climate change, according to a study involving Kansas State University researchers. The group of scientists—which included collaborators at Missouri Botanical Garden and Southern Illinois University, Carbondale—has published the study in the peer-reviewed journal Global Change Biology. Kansas State University researchers involved include Loretta Johnson, professor of biology; Mary Knapp, associate agronomist and state climatologist; and Jacob Alsdurf, master's student in biology, Olathe. The paper is a culmination of several years of close collaboration and interdisciplinary studies, including species modeling, plant growth studies and climatology. Big bluestem, or Andropogon gerardii, is a common grass in natural and restored prairies across the central Midwestern region that includes Kansas, Nebraska, Oklahoma, Missouri and Iowa. The grass species is an important component of forage for the region's livestock industry. It also is commonly used in grassland restoration of prairies across several million acres in the Great Plains region. 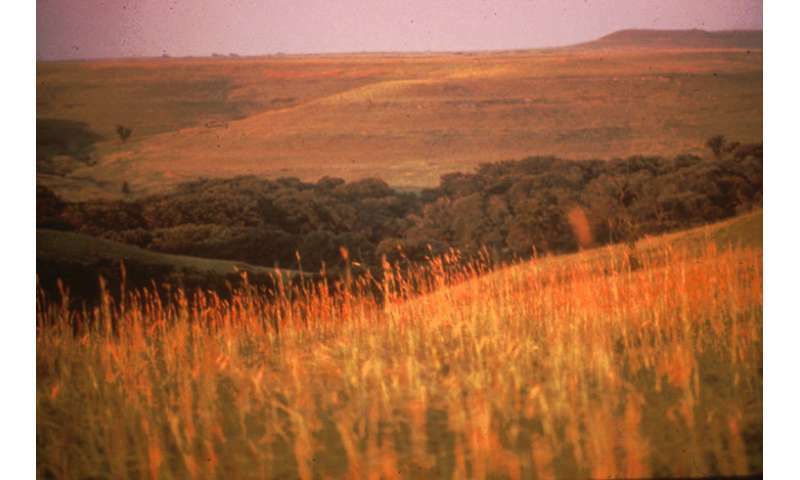 "Our results predict that climate change could greatly impact the tallgrass prairie as we currently know it, reducing forage for cattle in the drier parts of grasslands, in places like Kansas," Johnson said. In the Midwest, big bluestem can grow to 4 to 6 feet tall, but the researchers found that climate change could reduce its height by up to 60 percent in the next 75 years. As a result, the form of big bluestem that grows in the central Midwest could come to resemble the form that currently inhabits eastern Colorado on the edge of the species' range. 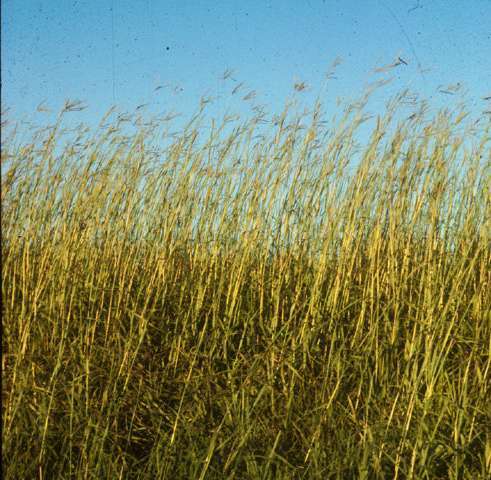 The tall forms of the Midwest grass could shift to the Great Lakes region where big bluestem is currently less common. The research team found that most of the change was because of alterations in rainfall that are expected to occur across the area, not because of increases in temperature. The authors are concerned the dramatic reduction in size of big bluestem foretells a fundamental shift in the nature of the Midwestern grassland ecosystem. "Because big bluestem is currently a dominant grass species of the Great Plains and makes up to 70 percent of the plant biomass in places, how the ecosystem works could be affected by predicted changes in growth of this species," Johnson said. "It was said in the past that the tallgrass prairies were so tall that a person riding a horse could literally get lost," said Adam Smith, assistant scientist in global change at the Missouri Botanical Garden. "Big bluestem is an iconic species in this system owing in part to its stature. If smaller forms come to dominate it could cause a fundamental shift in the habitat and ecosystem services prairies provide, such as forage for cattle." Big bluestem grass can live several decades, so prairie restoration projects will need to consider the form of plants that would thrive at a site several decades into the future, researchers said. The analysis also highlights the effects of climate change on common species that typically are not expected to be as vulnerable to anticipated climate change. Worldwide, 1 in 5 plants is already on the brink of extinction and climate change is only expected to add pressure on species struggling to survive. This study indicates that common species also may be vulnerable, researchers said.